June 4, 2012 4 comments on "Canning Spiced Peach Jam"
Canning spiced jam might seem a little hard, but it’s really not once you get the hang of it. A few weeks ago I took my boys to go pick peaches at an orchard. It was really fun. 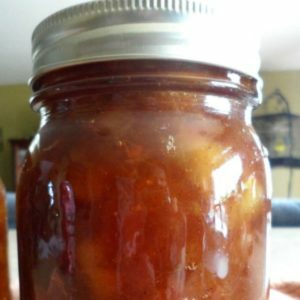 I tried making some homemade peach jam and it was really good. I decided to try spiced peach jam next. This recipe does not require pectin. Place all the ingredients in a large sauce pan, and mash together with a potato masher. Cook the peach mixture slowly, stirring constantly, until the mixture thickens. If you use a candy thermometer, cook the mixture until it reaches the jelly stage (220 degrees F). To test to see if the jam is done, take a small spoonful of peach mixture from the pan and place it on a plate in the refrigerator. If after it cools for a minute it is a jelly consistency (not runny or too hard), then it is done. Keep in mind that the jam will completely set after you process it in the jars, just like if you use traditional pectin. Immediately pour hot jam into hot, sterile jars, leaving 1/4 inch headspace. You can easily measure the head space with this inexpensive canning funnel. Wipe rims of jars with a dampened clean paper towel. Screw on lids. Process in a boiling water canner for 10 minutes. I was really curious to see how this jam would turn out. It tastes very different than regular peach jam. I would describe it as the same flavor as apple butter, but with peaches instead of apples. It is really good. Like this recipe? You might like my Elderberry Peach Jam and my recipe for canning raspberry jam too. 4 Comments on "Canning Spiced Peach Jam"
You don’t say to remove the skin. Do I cook and can with skin on? Hi! You can leave the skins on, but I think it would be better to remove them. If you don’t want to peel them by hand, if you boil the peaches in hot water for 1 minute and then give them a dunk in ice water, the skins will slip right off. This works for tomatoes too. Why does the spiced peach jam not take pectin where as other does not understand that I will be going to try this . Hi! There are different ways to prepare jam. In the old days before pectin, people cooked their jams until they thickened naturally so there was no need for the pectin. Some fruits naturally have more pectin in them then others. This peach jam does thicken up nicely without pectin when cooked to the proper temperature. The recipe for orange marmalade that I use does not have pectin in it either.